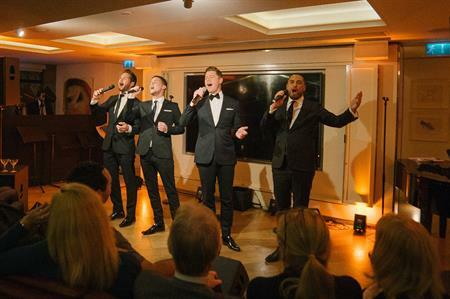 Guests packed into The Club at The Ivy for an evening of cabaret entertainment including music, dancing and magic. 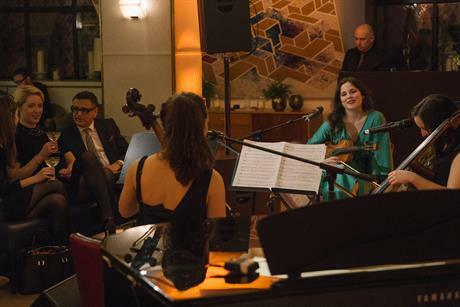 The Club at The Ivy was the setting for Sternberg Clarke’s spring showcase of entertainment acts on Monday night. Taking to the stage were a variety of cabaret acts, with Desmond O’Connor (not that one) the compère for the evening. 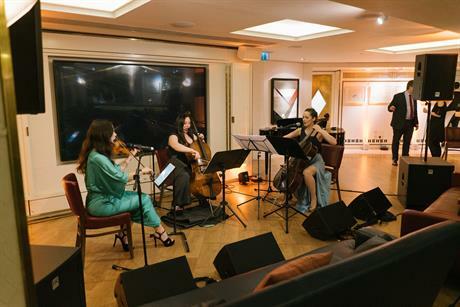 First up were Echo, a female strings and vocal trio who opened with a beautiful rendition of Amy Winehouse’s Back to Black. Next up was circus performer and gymnast extraordinaire Felipe, who adapted his balancing act to accommodate the room’s low ceiling admirably. Then came magician Maddox, who has supported Coldplay on tour and certainly knows his way round a Rubix cube. Leading us into the interval were Jackpack, a four-piece, harmonising swing group singing the songs of Frank Sinatra, Sammy Davis Jr et al. After the break came the wonderful voice of soprano Natalie, singing contemporary songs including The Long and Winding Road. The penultimate act was Frobacks, a four-piece comedy dance troupe who entertained the crowd with their dance moves and athleticism. 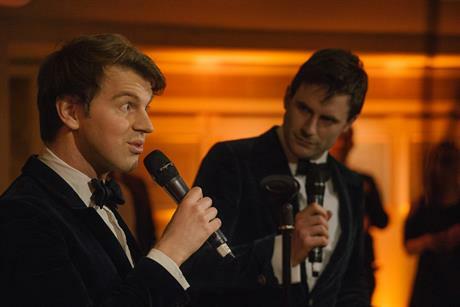 Last but certainly not least were Bounder and Cad, "the Ant and Dec of the liberal elite middle classes" as they declared. They performed a coupe of very funny songs and put their piano player to the test with some audience requests.